While Trakkers is best known for its popular Sunday trips, some members have discovered that they can enjoy winter even more with a whole weekend! We asked some veterans of weekend trips offered by the club to tell us what they like most. 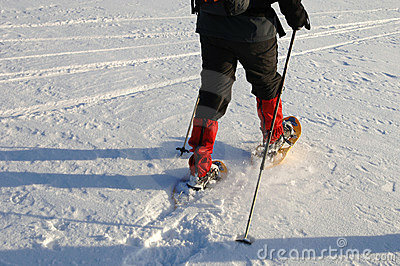 Weekend destinations offer skiing and snowshoeing options from the door or very close by. There is no rush to make it to the bus. 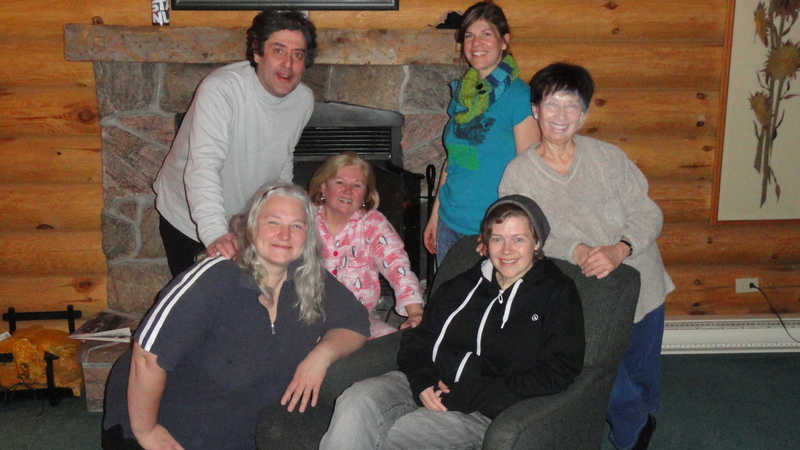 Skiers return when they want to a crackling fire, a warm meal, and wine with fellow Trakkers. Bogna likes that you can sleep in if you desire and have a cozy breakfast in your pajamas. 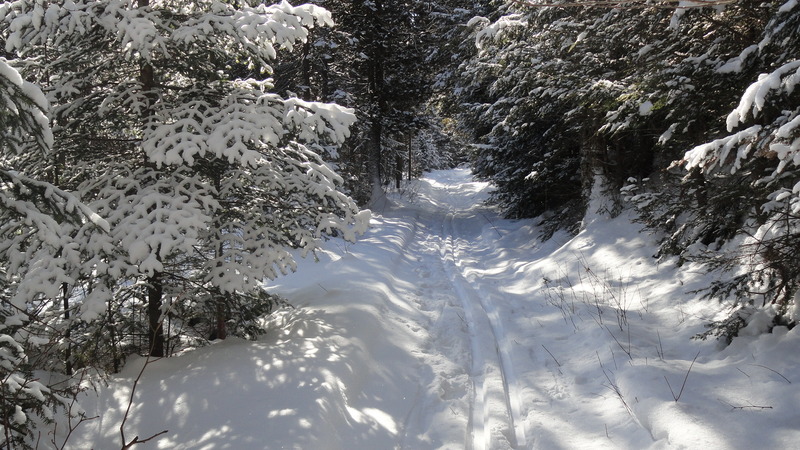 Trail near Blue Spruce Resort, Algonquin Park area. Spending a whole weekend in nature is rejuvenating. “The weekends provide a great opportunity to trade our hectic city lives for the peace and tranquility of the winter forest” says Weekend Trips Coordinator Barb. Some trips provide the opportunity to explore more remote surroundings than those offered on Sunday trip destinations. According to Henry, there’s lots more to do than just skiing or snowshoeing. Skating across the lake, saunas, hot tubs, and indoor games are offered by the different weekend destinations. One of last year’s highlights was an evening skate on the torch-lit ice trail at Arrowhead Provincial Park. “The only disappointing part of the weekend is that it goes by too fast” says Mark. For details about 2016 trip destinations and dates, check out the Sunday Trips web page. Get more information and sign-up at the Trakkers Open House on Friday November 20. This entry was posted in Weekends on November 17, 2015 by trakkers. The chill is in the air and the club is now officially in high gear to prep for the ski season. We’ve just launched our exciting new logo design and look, the Open House is next Friday, November 20, we’ve got final details for all our weekend trips — plus, we need to know your birthday (see below). You may have noticed the club’s new visual identity — new logo and colour scheme, and updated web site and social media pages to match. Doesn’t it look fantastic? A special shout-out goes to two of the club’s volunteers who single-handedly made it all happen: Han Zhang, the club’s Publicity Coordinator, who is responsible for the beautiful design work, and to Pascal Ethier, the club’s web site assistant, for updates to the site. Members can pick up some of our snazzy new brochures at the Open House to share with friends — or better yet, like us or share on social media to help spread word about the club. Hold the date to come out and reconnect with members in anticipation of the upcoming season or to find out more about the club! New and prospective members welcome. Light refreshments will be served and we’ll have some wonderful door prizes! Thanks to Our Snowfest Volunteers! The Trakkers booth got a ton of interest from prospective new members at the annual MEC Snowfest last weekend. 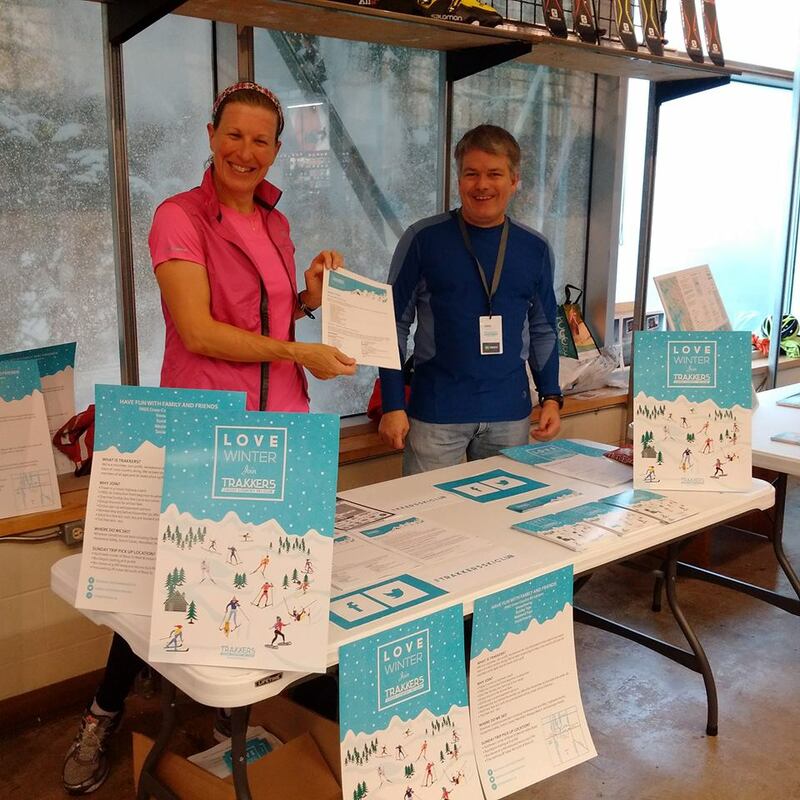 Special thanks to all the Trakkers members who helped out at the booth: Paula van Nostrand, John van Nostrand, Han Zhang, Sam Tosaria, Michelle Flanagan, Katja Lutte, Nathalie Auger, Carolyn Sitler, Karen Olsen, Anita Elash, and Doug Seaborn. Renew Before November 30th to Save! — and Don’t Forget to Provide Your Consent! Still on the fence about renewing your membership? Why wait? The annual membership fee is $75 until November 30, then it goes up to $80. Membership includes free lessons from our CANSI-certified instructors, one free Sunday bus fare (a $27 value), and access to all the club’s social events. Keep on trakkin — we’re approximately 8 weeks out from our first Sunday trip! And don’t forget to follow us on Facebook and Twitter for the latest updates! This entry was posted in President's Blogs and tagged cross-country skiing on November 11, 2015 by trakkers.